When you advertise at DebtSmart.com, you can be sure that your message will be seen by interested consumers. Founded in 1998 by Scott Bilker, best-selling financial author and publisher, the site was established to help people save money and manage credit card debts and loans. DebtSmart.com caught the attention of the public and media immediately after being launched. DebtSmart.com has since become one of the most popular and recommended sources of consumer self-help information. Additionally, DebtSmart.com is one of the most referenced websites by the media and has been mentioned in The Wall Street Journal, Money magazine, SmartMoney, Kiplinger's, CNN, Consumer Reports, and many more. DebtSmart.com offers a two primary monthly advertising zones plus an email blast. The below graphic displays these web paghe ad zones. Pricing is below as well. Additionally, we provide you with a suite of tracking tools and statistics using AdPeeps. Advertising rates and terms are structured for your success. At DebtSmart.com, it's not simply about selling ad space. It has to be a win-win-win. Advertisers sell their services, readers benefit from these services, and DebtSmart.com is supported in its mission to help consumers manage their debts and save money. There are NO CONTRACTS! All advertising on a month-to-month basis. You can start and stop anytime you wish. You will receive your initial rate forever as you continue to run your ad from month-to-month uninterrupted. You can change your ad at anytime at no additional cost. Powerful suite of statistics and tracking in your private account so you can monitor the success of your advertisements. TEXT Text $395 - Text ad is displayed on all pages of the website. Headline is a maximum of 40 characters and body text is a maximum of 80 characters. 300 x 250 Medium Rectangle $595 - Medium Rectangle is displayed on all pages of the website. Displayed in rotation on all pages of the website. 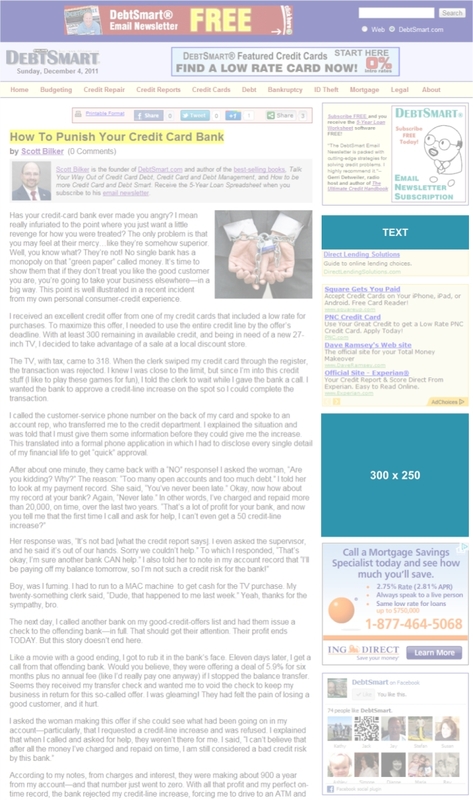 Email Newsletter Direct Email Free - All TEXT and MEDIUM RECTANGLE advertisers are featured in all email newsletter sent to 6,000+ subscribers weekly. Email Blast Direct Email - $600 Your email message is sent directly to approximately 6,000+ email newletter subscribers. We are on your team! We want your advertising message to reach our responsive audience. One of the ways to monitor the progress of your ad is through precise metrics. We provide you with a suite of statistical tools and information so you can actively track the delivery and response of your advertising. 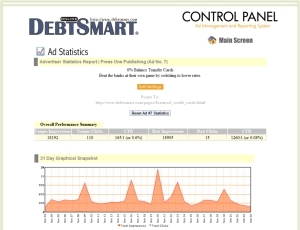 As soon as your ad starts running, you will receive login information for you DebtSmart.com Ad Statistics Account. From here you will have real-time access to 24/7 statistics to monitor ad performance. Click on the graphic on the right to see more details of the example Ad Statistics Control Panel. Copyright ©2019 Press One Publishing. All rights reserved.